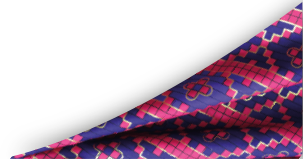 Chennai formerly known as Madras or is the capital of the Indian state of Tamil Nadu. Located on the Coromandel Coast off the Bay of Bengal, it is one of the biggest cultural, economic and educational centres in South India. According to the 2011 Indian census, it is the sixth-largest city and fourth-most populous urban agglomeration in India. The city together with the adjoining regions constitute the Chennai Metropolitan Area, which is the 36th-largest urban area by population in the world. Chennai is among the most visited Indian cities by foreign tourists. Carved from a single rock, the 32 feet idol of Sri Anjaneyar is the main highlight of this temple and is believed to have curative and healing powers. 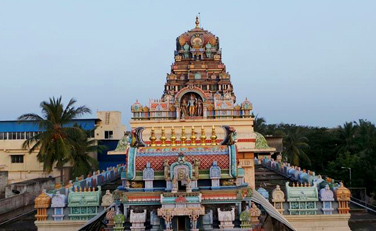 Located at Nanganallur, people come here to worship for good health. While the temple is a big attraction throughout the year but it is at its best on festivals like Hanuman Jayanti and Ram Navmi every year. 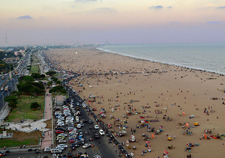 India’s largest beach happens to be Chennai’s Marina Beach which extends from Fort St. George to Besant Nagar. One of the best places to visit in Chennai for viewing a spectacular sun rise, this sandy delight is lined by palm trees on one side.An old light house stands on the southern end of Marina along with several other structures including an aquarium, a swimming pool and a park. Constructed in late 19th century, Connemara library is a treasure house of centuries-old publications. 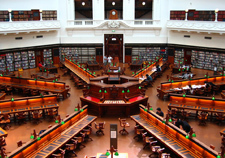 With a collection of over 600,000 books, it is one of Asia’s largest libraries. Be it avid readers or scholars doing research work, one could easily get lost in this enchanting world of books as they immerse themselves in their favourite activity. Nettukuppam is the perfect spot for you where you can spend some time close to nature. For the photography enthusiast, this is like a double treat for you where you can click some memorable pictures. 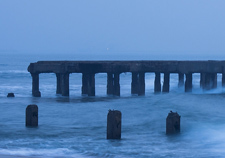 This broken bridge which is popularly known by the local is situated at the northernmost tip of Chennai. It is said that during the high tide the water rises to a great height where you will surely get drenched in the sea water.